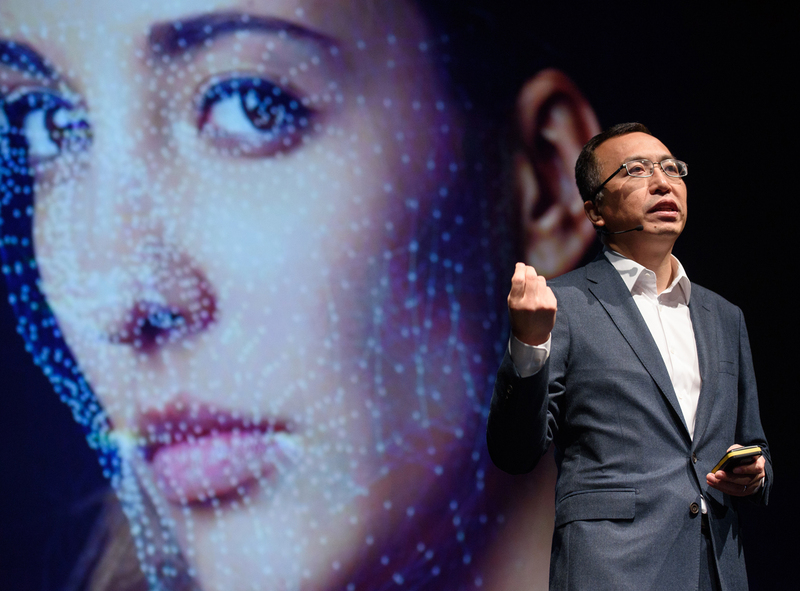 George Zhao, President of Huawei sub-brand Honor, unveils some of his company’s new products, including an artificial intelligence handset, at a global launch event in London, England, December 5, 2017. China has already become a global leader in the field of AI, which these days usually refers to machine learning. There’s no single way of ranking leadership in a field this new and ill-defined, but the U.S. and China are usually the top two countries on most lists. For instance, one count of papers presented at a major AI conference in 2017 found that 23 percent of the authors were from China and 34 percent from the U.S. Some estimates suggest that fundraising by AI-related Chinese firms has outstripped U.S. ones; Europe barely rates a mention. While headlines about China’s challenging the U.S. in AI are a recent development, China’s talent pool did not materialize overnight. It is the result of decades of talented Chinese training in the U.S. Many of the top Chinese figures in machine-learning research have degrees from U.S. universities and worked at U.S. companies, particularly Microsoft. In some ways, China and the U.S. are less two competitors working in isolation than they are common participants in a single global field of machine-learning research. Yet Chinese researchers also often assert that their nation has major advantages in machine learning, particularly the huge amounts of data generated every day by the world’s largest population of smartphone users. Such data is increasingly seen as the scarce resource needed to realize the potential of machine learning: Solving problems like facial recognition and self-driving cars relies on “training” algorithms to find patterns through repeated exposure to vast amounts of data. Since China has more data, the argument goes, it will eventually have better algorithms. More money also helps acquire more data and pay for the large amounts of computer processing power and human research time that it takes to laboriously train machine-learning algorithms. And both China’s government and private venture capitalists are pouring lots of money into anything that can be tagged with the “AI” label. These arguments imply that making progress in machine learning is now less about creative problem-solving than it is about mobilizing resources. And this may in fact be the case. When machine-learning algorithms started to make significant breakthroughs in performance around 2014-15, most experts say it was not due to new conceptual discoveries but rather to huge increases in computer processing power and the availability of structured data. A lot of what is happening in machine learning today is focused development rather than pure research. This resource-intensive phase of development plays to China’s strengths. It is difficult for government plans to tell people how to be creative or make theoretical breakthroughs. But plans can act as an effective signal to deploy more resources into a given sector, like AI. So we should expect lots of progress in machine learning to come out of China and its very talented pool of researchers. At the same time, we should be aware that the current convergence between China’s capabilities and the demands of machine learning research is not necessarily going to be a permanent one. Until just a few years ago, the U.S. was the world’s uncontested leader in the development of AI applications. According to the Chinese think tank Wuzhen Institute, the U.S. accounted for 71.8 percent of total global AI funding from 2000 to 2016. But today, everyone is talking about China. Chinese firms received 48 percent of global funding for AI startups in 2017, while the U.S. received just 38 percent, down from 77 percent as recently as 2013. Not only has China bolstered its spending on AI, but with 800 million Internet users, China simply generates more data, as Andrew points out above. Eurasia Group and Sinovation Ventures predict that this key advantage will allow China to match or lead the U.S. in three out of four waves of AI development in the near future. Moreover, China’s political and business leaders have demonstrated that they are determined to do so. Given the significant role China is likely to play in developing and deploying disruptive technologies, it is worth examining some of the conversations taking place in China about AI. In January, the Standards Administration of China released its “White Paper on Artificial Intelligence Standardization.” The paper sensibly asserts that “the ultimate goal of AI should be to benefit human welfare” and as such should be “consistent with the interests, ethics, and morals of most humans.” But in the context of China, the interests of most humans will likely be equated with those of the ruling Communist Party. Privacy issues are illustrative of how this could be both good and bad for average Chinese. The white paper points out that existing laws and regulations governing user consent about the use of personal information are insufficient, because AI tools now make it easy to derive information about many people from one person’s data. A recent example of potential abuse is when online lenders harass the friends of delinquent borrowers with robocalls. It would be unsurprising if authorities in China moved to prohibit these practices sometime soon. But at the same time, government agencies are actively finding ways to integrate citizens’ information in ways that similarly compromise their privacy. In Shenzhen, for example, the police department displays the faces of jaywalkers on large screens at intersections. AI technology has made it possible for law enforcement agencies to integrate all kinds of information about Chinese citizens. This is enabling the construction of a powerful police state, which is already being wielded to chilling effect in places like Xinjiang. The first of five recommendations proposed in the white paper is to strengthen “top-level design” in the standardization of AI. Who will be doing this designing at the top level is already apparent. The paper itself was drafted almost exclusively by government bureaucrats and representatives of China’s tech giants, like Alibaba and Baidu. What this will mean for the ethical application of AI technology is quickly becoming clear: Certain benefits will flow to consumers (Ant Financial has reportedly leveraged AI tools to offer insurance policies for as little as 2 RMB), but they will come at the cost of invasive government surveillance. China’s advances, advantages, and challenges in AI have received ample attention. So I want to highlight several features of China’s approach, and then consider certain questions that could provide important indicators of this trajectory. To start, the current alarm and enthusiasm over AI in the U.S. and China may, at times, seem excessive, and perhaps even warn of a bubble. However, it is clear that these technologies are emerging as integral to national competitiveness in a new era of great power rivalry, at a time when U.S.-China “entanglement” and interdependence are creating new frictions. The U.S. should not dismiss China’s approach to AI as merely involving state planning and industrial policies doomed to prove ineffective. While China’s AI plan may have captured headlines with the declared ambition to “lead the world,” the nation’s emergence as a powerhouse in AI predates and extends far beyond the state’s imprimatur and prioritization. Beijing may have labeled Baidu, Alibaba, Tencent, and iFlytek a “national team” in AI, but these are not traditional “national champions”: they have all emerged as leaders in the field primarily through their own efforts, but are now also receiving state support and contributing to a national agenda. While China is devoting ample funding to basic research, investments in AI, as well as funding for start-ups, have also started to surpass levels in the U.S.
Increasingly, China seems to be pioneering a new paradigm of innovation that hybridizes elements of the very policies that enabled traditional U.S. leadership in science and technology. Historically, the U.S. innovation ecosystem has been sustained by public-private partnerships and close collaboration between industry and the military. Today, similar synergies are emerging within China. For instance, Baidu is leading China’s National Engineering Laboratory for Deep Learning Technology and Applications, with partners including Tsinghua University and Beihang University. Chinese tech companies are engaging with universities for talent and research, such as the new Baidu and China Unicom “AI + 5G Joint Lab.” Meanwhile, Beijing is unrolling major educational offensives that seek to expand human capital resources rapidly. Despite concerns of a new cold war, leadership in AI will not be a zero-sum game; each nation may emerge as an “AI superpower” in its own right. At the same time, while it is not clear what “winning” an “AI (arms) race” would require, or even what the right metrics for progress may be, today’s trends create new risks and threats. Several dynamics are worth watching. Can China overcome its difficulties in semiconductors to achieve an edge in AI chips and specialized hardware? Will China’s apparent advantage in data become an enduring contributor to competitiveness or prove ephemeral? To what extent will the Digital Silk Road enable access to new and valuable sources of data? Within China, will the leveraging of these technologies for censorship and surveillance strengthen the state’s coercive capabilities or create new dependencies and vulnerabilities? And could the diffusion of these technologies threaten the future of democracy? I’ll continue this conversation by highlighting why the concerns over privacy and the state’s increasing surveillance and censorship capacities brought about by the rise of AI and big data technologies in China are not only legitimate but worth even more of our attention. China is placing huge bets on AI and big data. China’s interest in big data can be dated to the early 2010s, but a range of government policies introduced over the past two years offer us a much clearer picture of the government’s vision of AI and big data applications. Unsurprisingly, most of these government policies have a special interest in developing and supporting technologies that can be applied to the security sector. Statistics from 2016 show that most of the government’s domestic investment in big data industries has gone to public security projects. Data-driven technologies are not inherently intrusive. However, the unique online ecosystem and restrictive regulatory environment in China make compromising users’ privacy and an eventual all-seeing police state a highly likely scenario. Unlike their Silicon Valley competitors, Chinese tech companies typically design their products to include not just one, but various types of services. Tencent’s WeChat, for example, China’s most popular mobile chat application with over one billion users, is more than an instant messaging app but an all-in-one superapp. As a consequence, the line between a user’s public and private space is blurrier than ever. Recently, WeChat has gone beyond its commercial nature and partnered with the local government in China’s southern Guangdong province to launch a “digital ID” system where a virtual ID card serves the same purpose as the traditional state-issued ID cards through the app. Cases where WeChat users have been arrested for criticizing law enforcement or mocking state leaders not only indicate possible surveillance by the authorities or the company but also offer a glimpse of how, in the age of big data, an app’s consolidated functions, combined with China’s real-name registration system, enable government and industry to effortlessly profile individual users. Private companies are not only sharing users’ personal data with the authorities, but many of those companies—including the industry leaders—are proactively building their business model predominantly around the needs of the state. SenseTime, now the “world’s most valuable artificial intelligence startup,” unveiled a product in April it claims can automatically screen out online videos that contain pornographic or violent images, as well as text containing messages deemed sensitive by the authorities. These concerns are not limited to users in China. Given the pressure companies face to comply with Chinese laws and regulations on content controls and data disclosure, as well as the close relationship between many of these companies and the state, the internationalization of Chinese tech companies backed by projects such as the Digital Silk Road could mean a global expansion of Chinese tech norms and an information management model in accordance with a Chinese state worldview. AI consists of technology distinct from developments made in earlier technological revolutions, and that difference means we are still unsure how AI will impact the world. The increasing role of AI may not only result in leaps of productivity, but also economic growth and tremendous social benefits. AI has become a focus of international competition because of this potential to transform the world. China has already crafted national strategies for AI and big data, which include specific strategic goals. Given the importance and potential impact of these technologies, it is not difficult to imagine that AI and big data are leading us into an algorithmic society in which data and algorithms drive all kinds of machines (including social machines) upon which our world relies. However, algorithms can be very difficult to understand, so a shift toward a society driven by algorithms and big data may bring risks. This risk makes it necessary to develop legal and ethical regulations for the proper application and use of AI and measures against its potential misuse; European countries have already started this process. China’s tech industry and America’s Silicon Valley, the world’s two major Internet markets, each have their respective advantages. China stands out in at least three ways. First, the Chinese government continues to implement policies that support development of AI and big data technologies. Second, China is the world’s largest Internet consumer market and Chinese firms have accumulated enough big data and use cases for AI. Third, China’s relatively loose Internet regulation is more tolerant of technology and business innovations. Although several foreign media outlets have claimed that China is surpassing America in the AI field, in my opinion China still lags far behind America, especially in basic technologies (such as computer chips), core algorithms, and top-level talents. The ZTE incident—which highlighted the reliance of China’s high-tech industries on others—is an obvious lesson. Therefore, China needs to increase investment in fundamental research and talent cultivation to take full advantage of its supporting policies, huge market, big data, and consumption potential. Doing so will not only help it reap benefits from its domestic market, but an increase in domestic capabilities will help it succeed in the global market.